Explanation: The Luna 9 spacecraft above performed the first soft landing on another planetary body. Following a series of failures, the Soviet probe touched down in the Moon's Oceanus Procellarum region February 3, 1966. It accomplished this milestone in lunar exploration only shortly after the death of Sergei Korolev, the father of the Soviet Space Program. 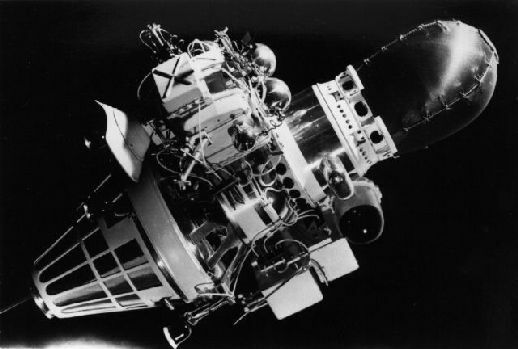 Reportedly, Korolev's colleagues wished to dedicate the Luna 9 mission to him but were unable to as his role as the Chief Designer was still a state secret. A pole, just visible extending at the lower left, sensed the impact with the lunar surface, triggering the spacecraft to eject the weighted, egg-shaped capsule (upper right). The 250 pound capsule then struck the surface, rolled upright, unfolded four spring actuated petals to steady itself, and transmitted the first views from the lunar surface back to Earth.